If you use Firefox on more than one computer, you'll want Foxmarks. Install Foxmarks on each computer, and it will work silently in the background to keep your bookmarks synchronized. You can also log in to my.foxmarks.com to manage your bookmarks from any computer. Install Foxmarks on all your computers. 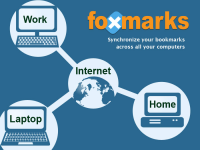 Foxmarks will automatically synchronize any changes you make, ensuring your bookmarks stay the same everywhere. You won't even know it's there. Never lose a bookmark again. Foxmarks backs up your bookmarks every time you make changes. View and restore your old bookmarks on our web site. Away from your computers? View, add, edit and delete your bookmarks on our website. Your changes will automatically be saved to your other computers. A pocket full of bookmarks! Visit our mobile site at mobile.foxmarks.com to access your bookmarks from your iPhone, Blackberry, or any other web-enabled device. Share your favorite bookmarks with friends. Our sharing server can display your bookmarks on a web page, in an RSS feed, or as a widget that you can add to your own blog or website. Keep your work bookmarks at the office and your personal bookmarks at home. Synchronize only what you need. Foxmarks lets you customize which bookmarks appear on which computers. You own your bookmarks. Import bookmarks from other websites, or export your bookmarks to a file on your hard drive. Your entire bookmark collection is never more than a click away on our web site.